One of those things I heard and now utter myself. In order to use your imagination you have to have one. So how do you get an imagination? One way we like to start is with books. Just letting your kids browse is a great thing to do. Whenever you can, especially rainy days or snow days when you’re feeling like curling up with a book anyway. Wrap everyone up and head to the local bookshop or library. One thing I love is to receive books for the kids from other people. Other people choose the best books. We all have our own likes and ones we gravitate towards, favourite authors and publishers. Other people give us a gift as we bring these new books into the family. Here are two books we received! Having thumbed through it myself I thought it would be fun not to say much about it but give it to the two older children. You choose is a series of pictures on the page. You choose what you need from each page to make up your story. You can live in the country and the city, farm or lighthouse. The point is…………..You Choose. Each page is full of huge range of objects and places. We have silly stories as well as serious ones. For the child that is not reading this is a lovely way they can make up a story based on the mechanics they already know from listening to stories. Those learning to read here is a fun way of ‘reading’ a story without the pressure. We have great opportunities for read aloud storytelling sessions using voices and everything. Mixed up Fairy tales is an excellent flip through book. We have a treasury book of fairy tales that we go through. They love to hear the same stories over and over. 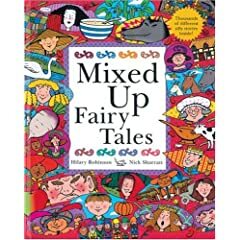 The mixed up fairy tales gives them a chance to play with the stories by randomly flipping the flaps and mix and matching the story. The biggest fun so far is trying to give a new title to the story. Reading is a pleasure when it is fun. If you enjoy a book you’re likely to try another. There are plenty of funny books that appeal to the little ones. We like these two because we get to play around with stories. Something we don’t usually do. It feels special to mix them up and make something up that is totally mine. They have the scaffold of the familiar tale or the objects and places they see but what they produce is totally theirs……….they get to use their imagination. I see that teddy, the LO, the dog and anyone within range is ordered to sit down while the MO or the BG read them a story. To see little boys reading, laughing and trying another version over and over again is always worth seeing. What books do you recommend that are short on words but encourage you to make up stories from what you see? You should link this up next Friday the 19th on my blog. The theme for Feed Me Books Friday is books for the imagination. The post would fit perfectly. That’s what I love about Feed Me Books Friday, moms are “choosing” books for me. I can visit their blogs, see their recommended reads and go away with some great titles for my visits to the library. .-= Adventure Mom Janna´s last blog ..Feed Me Books Friday: Stories About Love =-.